Meanwhile, at the Lucidite Institute, the pack is training under Zephyr’s instruction. He knows that soon they’ll have to go after the rabid wolf and also rescue other members of the pack. However, they need to work together in order to be successful. 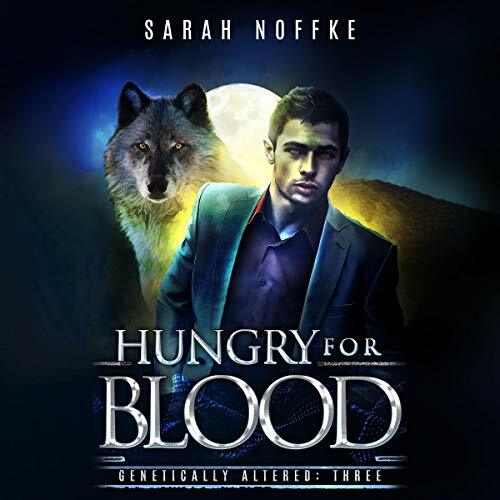 This 3rd audiobook in the enthralling Genetically Altered series is the best yet. It will have you on the edge of your seat and the hairs on the back of your neck standing to attention. Darker in nature than the other books, we get to see the workings of a warped mind, as the rabid wolf creates fear and anguish when he brutally murders women all across the city. The authors writing and the great narration makes you actually feel the terror of the women and the longing to kill that Hunter feels; it is both brutal and sad at the same time. This is a fast paced, exciting, anxiety filled story that still contains a great amount of humorous repartee. Tension mounts as we see Adelaide put herself in danger to try to find information, as Zephyr and the pack strive to capture Hunter before he kills again, the race to find the other wolves continues and all the while Mika and Drake are producing more creations. This story has great characters that grow from one book to the next and you can not help but love the easy, sarcastic back and forth between them. It's great to see the pack is becoming more cohesive, their talents growing and relationships forming. Mika is an excellent villain. He's crafty, intelligent but crazy as hell and the narrator shows this well. Then there is Drake, he totally lacks a conscience and reminds me of Josef Mengele. I not sure which of the bad guys is scarier. This is a great story that will keep you captivated from the first page to the last and leave you dying to get the next book. Story developing apace! What's next? Incredible book! I am amazed by how much development the author contains in her books. I am also an avid reader from her very first book and I thoroughly enjoy the development of the author as well. Read this urban fantasy take on werewolves! Sci-Fi at its best! I feel so bad by the end of this book but it is such a mixture of emotions. I cannot wait to see what comes next!